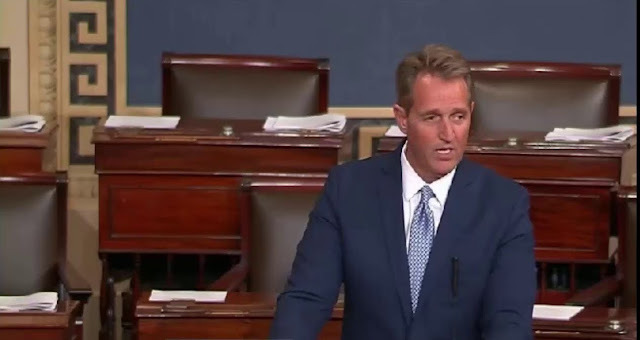 Sen. Jeff Flake announced Tuesday that he will not seek re-election in 2018, and then promptly took the Senate floor and began a lengthy screed against the state of Republican politics in the Trump era. "I rise today with no small measure of regret. Regret, because of the state of our disunion, regret because of the disrepair and destructiveness of our politics, regret because of the indecency of our discourse, regret because of the coarseness of our leadership, regret for the compromise of our moral authority, and by our -- all of our -- complicity in this alarming and dangerous state of affairs. It is time for our complicity and our accommodation of the unacceptable to end." "We must never adjust to the present coarseness of our national dialogue -- with the tone set at the top. We must never regard as 'normal' the regular and casual undermining of our democratic norms and ideals. We must never meekly accept the daily sundering of our country -- the personal attacks, the threats against principles, freedoms, and institutions, the flagrant disregard for truth or decency, the reckless provocations, most often for the pettiest and most personal reasons, reasons having nothing whatsoever to do with the fortunes of the people that we have all been elected to serve." "We must stop pretending that the degradation of our politics and the conduct of some in our executive branch are normal. They are not normal. Reckless, outrageous, and undignified behavior has become excused and countenanced as 'telling it like it is,' when it is actually just reckless, outrageous, and undignified." "When such behavior emanates from the top of our government, it is something else: It is dangerous to a democracy. Such behavior does not project strength -- because our strength comes from our values. It instead projects a corruption of the spirit, and weakness." "We have fooled ourselves for long enough that a pivot to governing is right around the corner, a return to civility and stability right behind it. We know better than that." "We were not made great as a country by indulging or even exalting our worst impulses, turning against ourselves, glorying in the things which divide us, and calling fake things true and true things fake." Admittedly, It would be great for the few dissenting republicans to vote more like their democratic counterparts. But the fact of the matter is that, they are conservatives and that's not the way they see world. They want the ACA gone, they want no gun control, and of course tax cuts for the rich. But what they can do it point out the abnormality of the Trump Crisis. They can defend our democracy, our norms, the office of the president, a free press, the truth. Hopefully, Flake, Corker, and McCain will continue to be loud voices and for the sake of all of us, let's hope they are joined by those who plan to remain in office.